With a unique pistol-style grip, Iwata Eclipse G-Series Airbrushes have the appearance of miniature spray guns, yet they perform like large airbrushes. These multipurpose, high-flow, high-detail airbrushes are versatile enough for a wide range of uses. Commonly used to spray premixed or heavier paints, they are also well-suited when precise control is needed for applying moderate to large amounts of paint on a variety of surfaces. All three models work well with most twin-piston airbrush compressors, including the Iwata Studio Series Power Jet and Power Jet Lite compressors. G3 Pistol-Grip Airbrush — The G3 has a 0.3 mm stainless steel nozzle and a 4 oz (118 ml) stainless steel cup with lid. 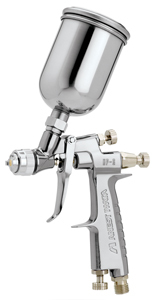 G5 Pistol-Grip Airbrush — The G5 has a 0.5 mm stainless steel nozzle and an 8 oz (236 ml) stainless steel cup with lid. G6 Pistol-Grip Airbrush — The G6 has a 0.6 mm stainless steel nozzle. A dual-purpose air cap/fan adjustment valve lets the airbrush spray round or oval patterns, and a special airbrush bottle fitting allows for quick color changes without cleanup. 0.6 mm Needle — Use this needle with Iwata HP-G6 airbrush model. 0.6 mm Nozzle — Use this nozzle with Iwata HP-G6 airbrush model.